U.S. #2720 – Fleetwood First Day Cover. The stamp was designed by a first-time stamp designer, Clarence Lee, who used an airbrush to produce the artwork. The last stamp issued that year, it went on sale on December 30, 1992, and proved extremely popular. Many post offices sold out of their stocks in days and the stamp was in high demand in Asia. U.S. #3895 – The two-sided Chinese New Year sheet of 2005. 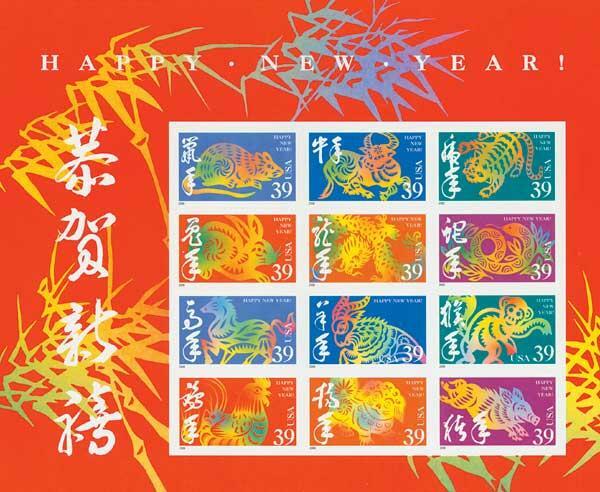 The 1992 Chinese New Year stamp marked several firsts. 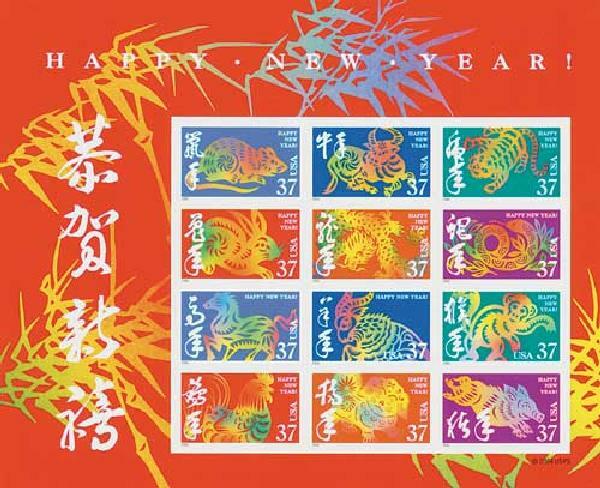 In addition to being the first Lunar New Year stamp, it was also the first Happy New Year stamp, and the first non-high-value stamp issued in panes of 20 (rather than 50). U.S. #3997 – The one-sided Chinese New Year sheet of 2006. When the stamp was first produced, the USPS didn’t have plans to produce more Lunar New Year stamps. 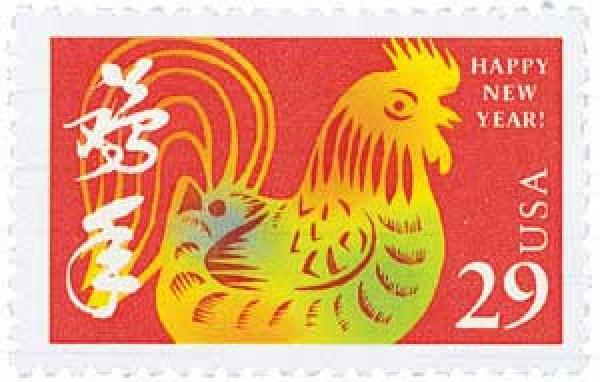 But based on the popularity of the Rooster stamp, they knew a series would be popular and issued a second Chinese New Year stamp on February 5, 1994. 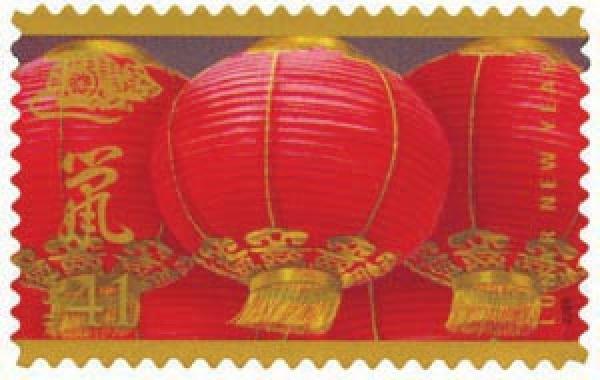 U.S. #4221 – The first stamp in the modern Lunar New Year series. The final stamp in the initial series was issued in 2004, honoring the year of the monkey. 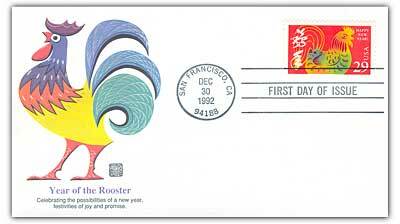 The following year, the USPS decided to issue a souvenir sheet picturing all 12 Chinese New Year designs. At the 2005 first-class rate of 37¢, however, the cost of the sheet would have been $4.44 for 12 stamps. The number four is an unlucky number in Asia. U.S. #2720//5154 – Get all the Chinese & Lunar New Year stamps to date in one convenient set and save. The Postal Service decided to make the sheet double-sided. The total price of the sheet of 24 then became $8.88; eight is a lucky number in Asia. In 2006, the first-class rate became 39¢, the total for a sheet of 12 was $4.68, and production of a single-sided sheet was possible – as luck would have it. Based on the popularity of these stamps, the USPS inaugurated a new Lunar New Year series in 2008, beginning with the Year of the Rat. 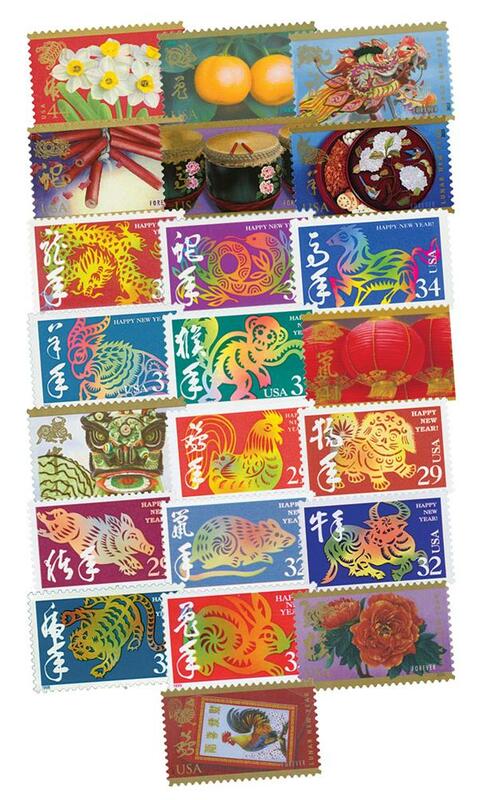 Click here for lots more Chinese and Lunar New Year stamps. Click here to learn more about the Chinese New Year including its history, traditions, and much more. 2 Responses to "This Day in History… December 30, 1992"
A good begining in 1992,why not give lead to other Asian American stamp collectors ? Indeed it’s given to India in 2017 when USPS issued its first ‘Diwali’ stamp just a few months ago. Its popularity would be known when data on its sales (in US Dollars) is gathered in mid 2018. If not promising/encouraging, I don’t believe one can see new issues of Diwali stamps. It’s simple economics for a service (USPS) that’s already experiencing downward sales figures, thanks to internet media and ‘for profit’ competitors like FedEx, UPS and Amazon.com (to some extent). Why do you think US issues yearly stamps for Christmas, Hanukkah, Kwanzaa celebration? It’s because even the non-stamp collectors purchase them use as postage in big numbers -unlike for Diwali stamps. And I’m a US Citizen from India.